Welcome to the first Weekly Sitrep for 2019! I have spent a fairly productive week working on my army level horse and musket rules for my book and I am pretty pleased with the progress I have made. There is a long way to go but early indications are quite positive. I have really enjoyed dipping into the Kindle version of David Chandler's Campaigns of Napoleon and am pleased I was able to get this - it is certainly easier than lugging the book around! I have cobbled together a small order to our friends at Warbases for the additional bases I need for the Kurz and Allison ACW project as I have opted to base the figures individually rather than on multiple bases. I could always get movement base sabots if I needed to. The main reason for this is the forthcoming publication of Rebels and Patriots - the latest title in the 'Lion Rampant' series by Dan Mersey and others as individual bases loom large with this. 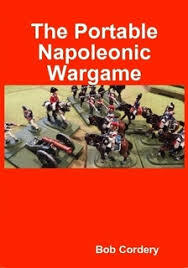 The biggest (and best) news this week though is the publication of the latest volume in the Portable Wargame series by Bob Cordery - The Portable Napoleonic Wargame. I have seen the draft version for this and am awaiting my own copy so I will not review this at the moment. Suffice it to say though, Bob has done it again and this book should be on the bookshelf of any wargamer with a smattering of interest in the wars of the Corsican Ogre! I think you are going to enjoy! Trust me - you will not be disappointed!